Great work! I love your technique. Chandrama Anderson introduces a powerful and creative tool that therapists of all persuasions can use to great effect. Using her technique, the client is led through a process of writing and drawing which lays bare multiple levels: emotional, physical, mental, spiritual, family, relationships, sexuality, and financial. Richly illustrated with case examples, her presentation is so clear and practical that readers are likely to say to themselves, "Duh! Why didn’t I think of that?" "[Personality Mapping is] a very interesting and clinically useful technique . . . I practiced psychiatry and psychoanalysis for 30+ years . . . This was helpful for many patients, but unable to help many patients delve into material that was too emotionally dangerous for them. I wish that I knew of your technique of Personality Mapping. It is a wonderful avenue into this material . . ."
"[Personality Mapping] is particularly helpful and useful in assisting us in developing a new mental paradigm in conceptualizing our work with individuals, couples, and families." You, your friends and associates are people that want to know more about yourself: who you are, how you got here, what's in your way. You want to understand yourself, your family, and your relationships. See the cover of the forthcoming Connect2 Personality Mapping book for clinicians! 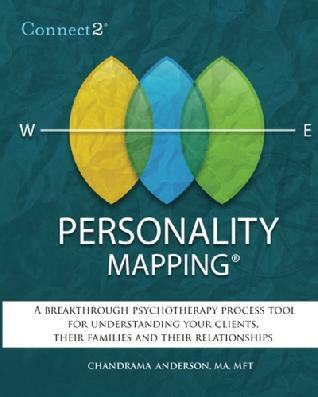 Connect2 Personality Mapping is a powerful guided process designed to explore the layers of the physical and psycho-emotional Self. It is a way of illuminating an individual’s intra- and inter-personal relationships, which may include one’s own-- and often previous generations’--unfinished business. As we grow into adulthood, these personality maps are carried into our personal and work lives, affecting how we express ourselves, interpret our emotions, and interact with others. If they are distorted by a difficult upbringing, they can become roadmaps for unhappy relationships and skewed views of reality. But we now know that the brain retains neural plasticity throughout life (Cozolino, 2002), and we can learn to respond differently once we understand our own circumstances. The purpose of Personality Mapping, then, is to examine the maps that direct our feelings, to explore how they affect our behaviors and relationships, and ultimately, to integrate these maps into our adult awareness so that we are able to make better choices. Simply put, the end-goal is to alter the maps, transform the brain, and reframe our feelings and responses so that they become rich, appropriate and authentic. 1 Kurtz (1990) calls them maps. Fisher (1992) refers to them as character strategies. Jung used the term personality types. Myers-Briggs tells you what your personality style is -- Personality Mapping shows you how you got here, highlights where you want to go and what might be slowing you down. The goal is to develop tools to live a successful, authentic life, and change your brain along the way. Thank you for your excellent presentation at our conference Creativity and Madness, Psychological Studies of Art and Artists, in Santa Fe this past August. The comments about your presentation from our questionnaires were uniformly laudatory. Your content and presentation style gave us a very interesting and clinically useful technique and information. I practiced psychiatry and psychoanalysis for 30+ years, using the traditional psychoanalytic technique. This was helpful for many patients, but unable to help many patients delve into material that was too emotionally dangerous for them. I wish that I knew of your technique of Personality Mapping. It is a wonderful avenue into this material for many patients who cannot be reached by traditional techniques. Thank you for sharing your knowledge and experience with us and bringing this clinically exciting material to our attention. Please contact me to speak, teach and/or present Personality Mapping.